At the Auburn Rotary Club's June 25 meeting, the club installed new officers for the 2014-15 club year, which begins July 1. 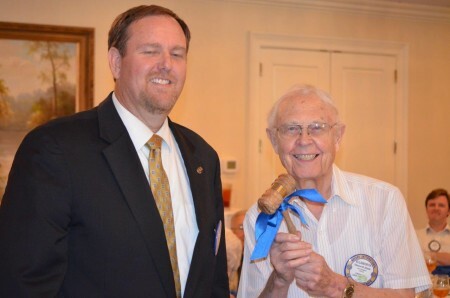 As part of the club president installation process, the club conducted its annual “Passing of the Gavel,” which began with the club’s earliest past president in attendance, Ellsworth Steele, who served from 1959-60 (pictured on the right with outgoing Club President Jim McLaughlin) and processed through the hands of other past presidents until it ended with incoming Club President Kathy Powell (pictured on the right with outgoing Club President Jim McLaughlin). 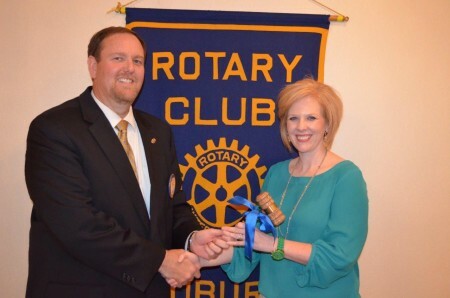 For more information about the Auburn Rotary Club or becoming a Rotarian, visit www.auburnrotaryclub.com.